Elijah Wood said he's known for a while that director Peter Jackson was hoping to have him reprise his "Lord of the Rings" role of Frodo Baggins in the first installment of "The Hobbit," due out in 2012. "I actually spoke to Peter a while ago and I had an idea that there was something that they were thinking about. And this was quite some time ago now," Elijah told a small group of reporters on Saturday following his Television Critics Association Winter 2011 panel for his upcoming dark comedy on FX, "Wilfred." "It was in my mind as a possibility, but not as a fully formed concept that they were sure about until recently where I was given an offer." Reports recently surfaced that Elijah was heading back to join Cate Blanchett (Galadriel), Sir Ian McKellen (Gandalf) and Andy Serkis (Gollum) in Peter's newest project – which stars British "The Office" vet Martin Freeman (Bilbo Baggins) and BBC America "Robin Hood" star Richard Armitage (Thorin Oakenshield). While many expect Frodo to return at the end of "The Hobbit" for that cameo, Elijah said he actually didn't know where his character was going to fit in the upcoming film. "I actually don't know. I probably know just about as much as everybody else does," he said. "I haven't read a script, I haven't read any of the scenes that the character's going to be in. "It's going to be very small," he continued of his return role. "It'll really just be a nod, which I think is great. I'm just excited to go back… You [don't] often — 11 years down the line — get a chance to go back and revisit a character and a place and a time in your life." 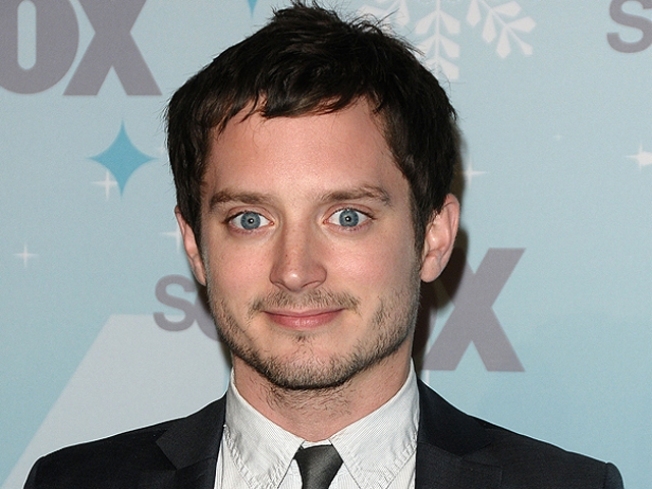 While playing Frodo is a character for which Elijah has a built-in fan base, his new show, "Wilfred," a remake of an Australian comedy for FX, is a change of pace. The show sees Elijah playing Ryan, a young man who, following a suicide attempt, begins an unlikely friendship with his neighbor's dog, who he sees not as a canine, but an Australian man, dressed in a cheap dog suit. "It's exciting for me to be part of a comedy," Elijah said of joining the TV show, which also stars original Australian "Wilfred" portrayer Jason Gann, as the canine chaaracter. VIEW THE PHOTOS: From Elf To Pirate To Hollywood Heartthrob: Hot Pics Of Orlando Bloom! "That's something I've never really been given an opportunity to do and I'm so proud of this ensemble and this creative process. It's been a lot of fun so far. I'm really excited for where it's going to go," he added. Adapted for FX by David Zuckerman, who helped develop "Family Guy," Elijah said he was drawn to "Wilfred" because of its off-kilter nature. "To be working on something that is not easy to define and is quite unique and has a darkness — we can explore that," he said. "We're just starting [work on the project]. We did our pilot and we're gonna start our production in March and we'll just have to see where it goes. I'm just excited about the prospect of where it's going."